Behind any successful business is a series of strong, lasting relationships. Pinnacle Structures Inc., a Colorado licensed retaining wall contractor, is no exception to this rule. President Jason Neppl takes pride in the relationships he’s built not only with his local Keystone producer, Colorado Best Block, but also with local general contractors. “We install 100 percent Keystone products,” explains Neppl. “So, we work very closely with Colorado Best Block to find jobs.” Pinnacle’s strong relationships with local general contractors are an added bonus when it comes to job awards. “There’s a lot of value in having a general contractor who understands how critical it is to construct Mechanically Stabilized Earth (MSE) walls correctly,” said Neppl. 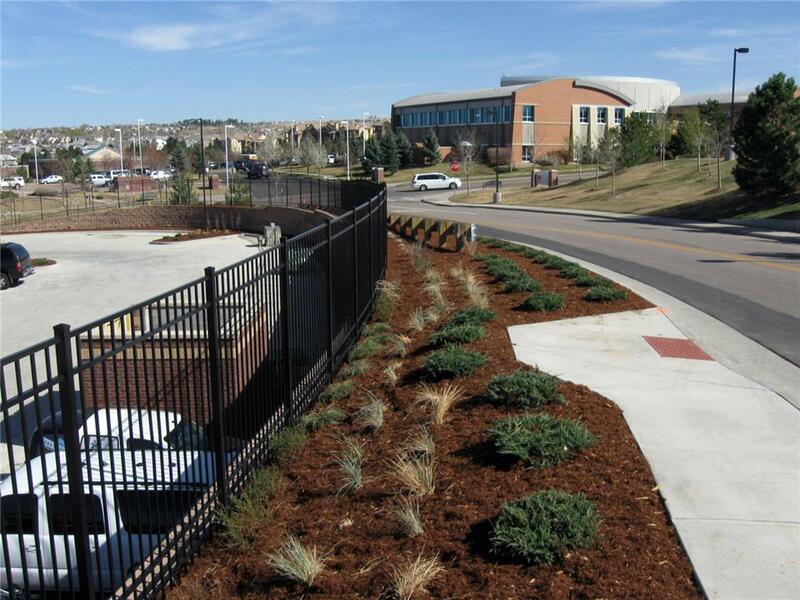 When Douglas County began planning their new Sub-Station in Highlands Ranch, Colorado, it was Neppl’s relationships that helped secure the job for Pinnacle Structures Inc. The Douglas County Sheriff Sub-Station sits atop a hill within an existing commercial area. Surrounded by roads, the site required two large and distinct retaining walls. While both walls used Keystone Compac units, each wall required its own unique construction method. In addition, because space was limited on-site, the walls were not built simultaneously. “We came in and built the front tiered walls first which allowed the general contractor to build a parking lot. When the project progressed further, we came back to build the larger back retaining wall,” explained Neppl. The front wall reaches heights of nearly 14 feet, split into two tiers. Installation crews tied the tiers of the front wall together using geogrid. “The first layer of grid was installed on the first course of block of the first tier, and then we went every 2 feet. The first layer of grid goes back the complete height of the entire wall,” explained Neppl. Indeed, the load on the back wall is quite significant. A heavily traveled road with a large transportation depot is situated along the top of the wall. With the cut into the area for the building, reducing the road's shoulder, Colorado Department of Transportation (CDOT) required guard rails to be installed. “We installed ‘sleeve its’ for the CDOT guard rails, which offer better stability over sonatubes for high vehicle traffic areas,” Neppl said. Conditions in Colorado always bring unique challenges to any application. “The soil on the site is your typical Colorado clay. When it rains, the clay swells up and gets sloppy. It’s not a good soil for retaining walls,” said Neppl. To combat the challenging soil conditions, draining tiles were laid directly behind the wall and class one structural material was brought in for the grid zone. “The grid extends several feet behind the walls, so when we added the class one material to the grid zone we were able to obtain a passing test; 95 percent compaction and eight to ten percent moisture,” continued Neppl. For such a challenging site, selecting the correct product was crucial to the success of the project. However, the commercial area surrounding the sub-station was already heavily developed with other landscape products. “We needed something that would not only do the job but would help blend well with the existing landscape,” Neppl expanded. Colorado Best Block was able to provide the aesthetic appeal needed for the job with the Sierra Blend rough cut Compac unit. “I’m big on quality,” said Neppl. “I work with Colorado Best Block and we produce all the products needed for a project at the same time so it all looks the same.” In an industry where relationships can be the difference between securing a project or not, Keystone and its network of licensees are committed to providing quality products and services contractors can depend on.